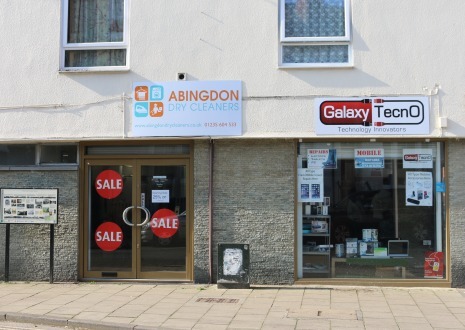 Yesterday (22nd Feb 2019) saw the opening of Abingdon Dry Cleaners in East St Helen Street. The former Patisserie Pascal has been split into two. They have 25% off for a few days. Another lovely sunny day here in Abingdon. 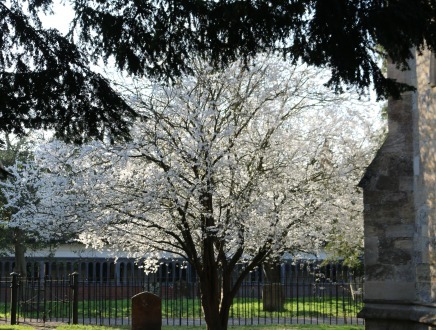 This picture is the blossom in St Helen’s Churchyard. There are a number of groups run by churches in Abingdon for people fifty years and over. 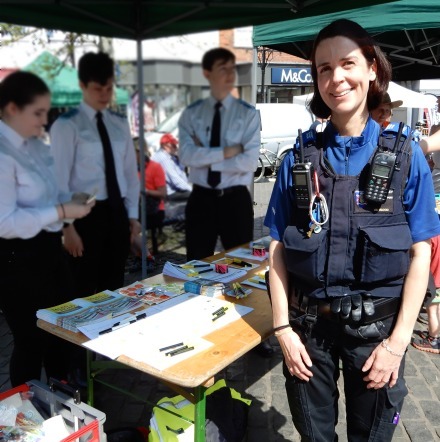 PCSO Allison Blood was at one of them yesterday giving a talk. She was at Back to 35, a group for the over-50s that meets on the 1st and 3rd Thursdays each month from 10.30 am at 35 Ock Street. She was giving them advice about how to stay safe from fraud and purse thefts. PCSO Allison Blood won the Oxfordshire Police Community Support Officer of the year award. Sorry I am so late giving you that news which happened back in May 2018. There was another talk yesterday called ‘Active Ageing: Exercise and Brain Health’. This was in the King Charles Room (Kings Head and Bell), and given by by Neuroscientist and Alzheimer expert, Dr Sana Suri. The talk was put on by the Abingdon ATOM Society. 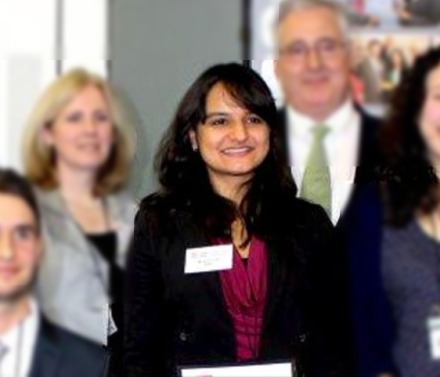 The room was packed and Dr Sana Suri said ‘It is good to see so many people interested in ageing‘. Some of us were there trying to get some tips to avoid dementia. Dr Suri said ‘What is good for the heart is good for the brain’. It was a sunny day in Abingdon. 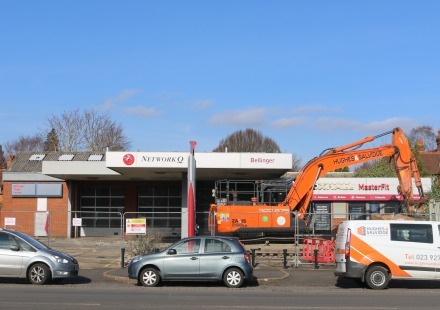 Demolition experts have moved into to the ex Bellinger Garage on Ock Street – after the new care home got planning permission on appeal. 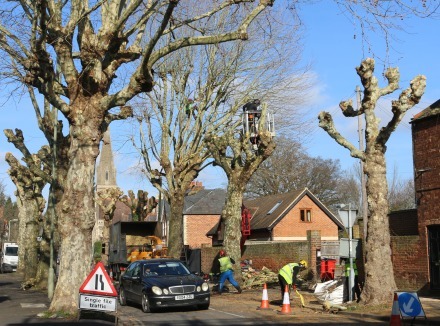 Nearby work has been underway pollarding the Plane trees on Conduit Road. The road has been kept open and the tree surgeons pass down a log at a time on the one side, allowing cars to pass on the other. There is a new website called northabingdon.co.uk/. On it is the announcement of an exhibition at the Northcourt Centre on Thursday 28th February from 3:30pm – 8pm showing more detailed plans for the first 425 homes of the 900 that have got outline planning permission. 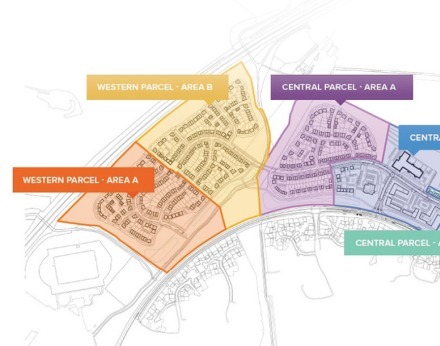 The three ‘parcels’ are those nearest Tilsley Park. The developers will probably be looking for feedback from the locals attending the exhibition before submitting their final plans. The other thing this housing will help finance is the Lodge Hill Interchange, but those plans still need to be agreed with the Highway Agency. The 900 home development includes a mixed-use local centre, retirement apartments, care home, primary school and public open space. 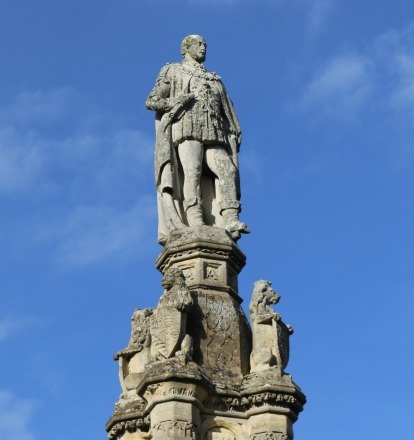 Prince Albert, seen here in Albert Park in Abingdon, was born on 26th August 1819 and so his bicentennial will be later this year. Today, from his pinnacle high above Albert Park, he watched an onslaught of children and hounds. School children were on half term kicking balls about in the sunshine; hounds were being walked and run by the usual crowd. 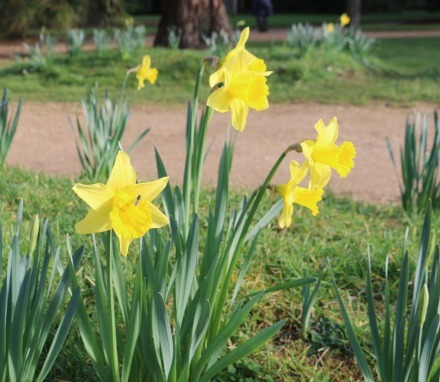 The daffodils have been dancing near the bowling club, like the ones Wordsworth wrote about in 1807. Prince Albert has a Twitter Feed and has tweeted royal recognition to John Ruskin on his bicentennial. His highness recently celebrated a wedding anniversary, and asked what one should get Victoria on their 179th. This will also be the bicentennial of his beloved Victoria who was born on 24th May 1819.